The exercise, culminating in a ‘firepower demonstration’, will test the UK and Sultanate’s ability to operate together in austere conditions through the deployment of a Coalition Joint Task Force. The shipping of the equipment for the exercise is coordinated and delivered by Joint Forces Command (JFC), who will coordinate sea and air transportation (often heading to the new Joint Logistics Support Base) prior to and following the exercise. 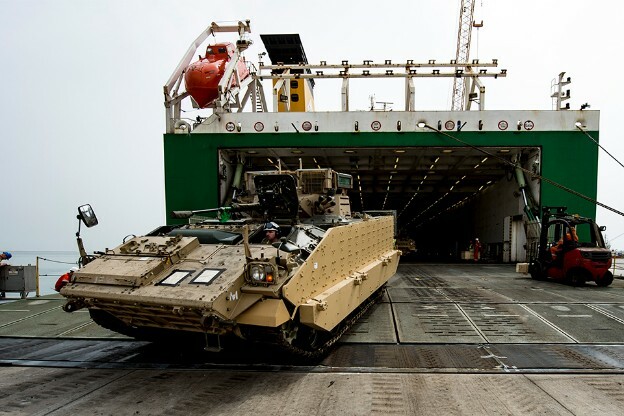 The equipment being transported to Oman will be crucial to the army, Royal Air Force, Royal Navy and Royal Marine activity during the exercise. The 2 RORO ships which arrived this week in Duqm left the military port in Marchwood, near Southampton, in late July. The ships sailed into the Port of Duqm on the 10 and 14 August, each with a cargo of over 3,500 tonnes. The cargo included vehicles such as Warrior armoured fighting vehicles, Scimitar CVRT (combat vehicle reconnaissance tracked) and Bulldog personnel carriers.